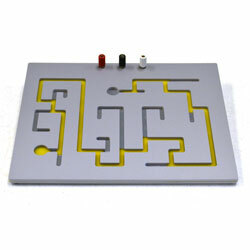 The automatic tally maze attaches to an impulse counter and / or stop clock (not included) to record errors and time required for completion. While wearing a blindfold, subject traces along the anodized pattern with a metal stylus. Reduction in number of errors for successive trials is a useful demonstration of learning and memory. Blindfold not included. The economy clock / counter is a timing device that is capable of accurately recording times down to the millisecond. Blindfold masks sold in a pack of four. Patch Cords for timing and counting systems.